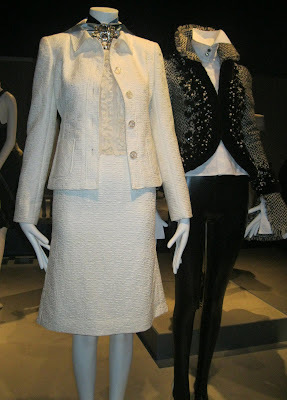 A cream-colored Valentino suit, left, a Chanel jacket on the right. 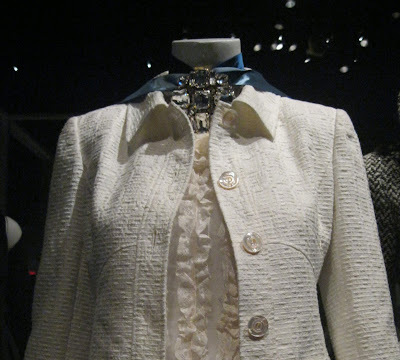 For this week’s Daphne Wednesdays, I wanted to share with you this cream-colored Valentino suit and blouse, of cotton, wool and silk, from the “Chic” section of Daphne Guinness, now on view at The Museum at FIT. Exactly. This suit exemplifies that ideal and I adore everything about it, from the color to the fabric to the A-line skirt. Daphne Guinness is on view through January 7, 2012. Both are just fabulous...thanks for your coverage, Jill!! Hi Pam, thanks for your nice compliment. I hope you will cover the Jean-Paul Gaultier exhibit coming to Dallas next month. I don't think I can make it there to see it. I love that dandyish grey tweed jacket on the right! Sooooooooooooo wonderful I love the back jacket at the back too. When do you think is the best month of the year to visit New York: not too cold or hot or rain??? I'm eyeing that black bolero jacket in the back too! 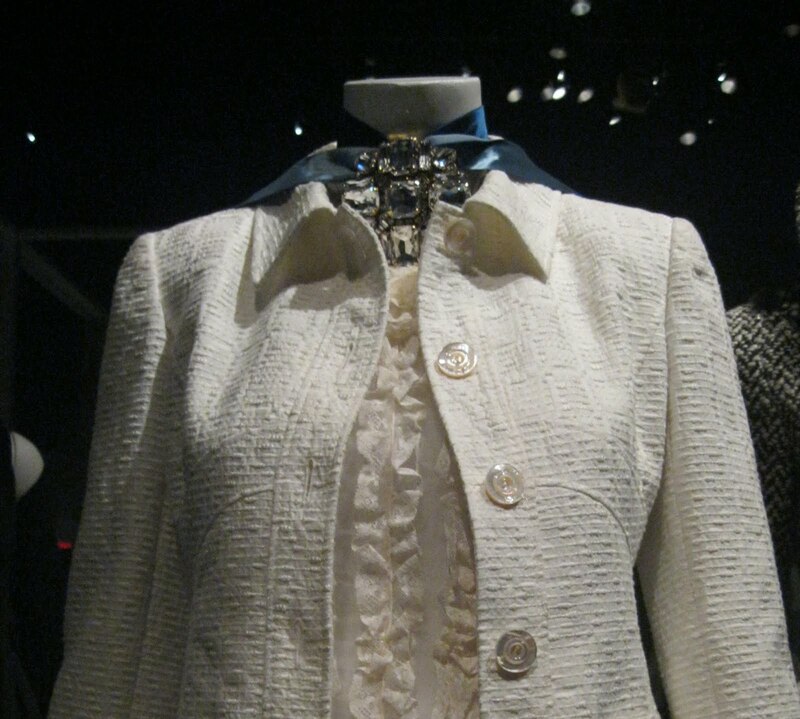 Altho, I must say that fabric is fascinating on the white. soo love that valentino outfit!!! fabulous!!! wish i could have that on my closet... enjoyed your blog.. following you now...hope you could visit my blog too.. kissess!!! Hi Veshoevius, I'm posting a picture of the tweed jacket this Wednesday. It's Chanel! Hi Sacramento, I think two of the most beautiful months in NYC are April and October. They can have their unexpected moments (I once ran a race in the snow in April! ), but mostly they are gorgeous, particularly October of course. Autumn in New York! 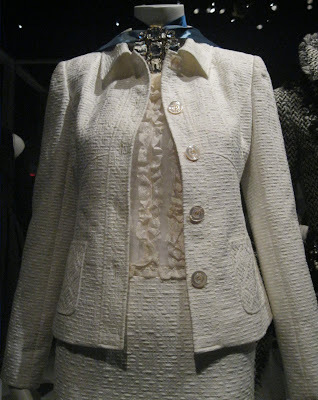 Hiya Paula, another vote for the Chanel jacket, it's going up as part of this Wednesdays Daphne-fest! I hope you can find a similar shade of purple polish. That color was particularly wonderful on you. Hi Serene! Did you see that great interview last night on '60 Minutes' with Steve Jobs' biographer? I have a feeling you and I are BOTH going to be reading that book, along with a ton of other people. What a fascinating and complex man he was. Hi Dina, thanks for stopping by, and thanks for following! I am SO glad to have met you. You are my first fashion friend in the Philippines. I lived there for three years when I was young. I particularly loved Manila and have great memories of Shoe Mart! Oh how I miss Shoe Mart!